Produced by Thom Bell, "Happiness Is Being With the Spinners" is the seventh studio recording by the legendary R&B group. It was the band’s final release to reach the Top Ten on Billboard’s Top R&B Albums. It features the chart-topping single “The Rubberband Man” and the standout “Wake Up Susan”. As 1975's classic Pick of the Litter seemed to garner its strength from melancholy and faultless arrangements, this 1976 studio follow-up often wallows in style over substance and platitudes. The pretty but vacuous "Now That We're Together" is all over the road and has inane lyrics like, "You're such a great crowd/Why don't you sing loud." Other tracks "You're All I Need in Life" and "If You Can't Be in Love" all put into practice arrangements and themes that were better executed on New and Improved. Although things get a little mushy here, producer Thom Bell and the Spinners do have their moments here. The highly danceable and infectious "Rubberband Man" breaks out of this effort's stodgy surroundings and gave lead singer Philippe Wynne plenty of room for his skilled scatting and effortless riffing. The best non-hit on this effort is "Toni My Love." The song is jazzy rumination on a mature relationship and it's the only track that's skilled enough to stand tall on Pick of the Litter. 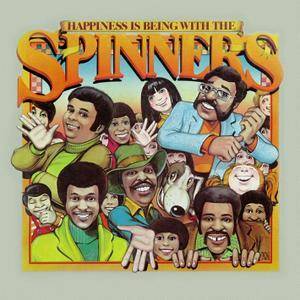 Despite the few high points, Happiness Is Being with the Spinners winds down before any of its predecessors did. The best of the last tracks, "The Clown" is a little overwrought and Philippe Wynne sounds like his hands are tied. Happiness Is Being with the Spinners is one of the first Bell efforts to be partially recorded at Kaye Smith Studios in Seattle, WA, and was mastered at A&M Studios rather than Philadelphia's Sigma Sound. That fact arguably changed the winning formula and for the most part this falls short of the work that came before it. Produced and Arranged by Thom Bell. Engineered by Don Murray. Recorded at Sigma Sound Studios, Philadelphia, PA. & Kaye-Smith Studios, Seattle, WA. Mastered by Bernie Grundman at A&M Studios, Hollywood, CA.